The trick to creating your perfect wedding theme is to incorporate your favorite colors but not to overdo it. Paired up with the right accessories, even the most unusual color choices can look incredible! Now, let’s have some fun with the fab colors Green, Pink and Brown. Green is one of those colors that you either love or can’t stand, but when done right, it can help create a calm, comfortable and even elegant wedding theme. 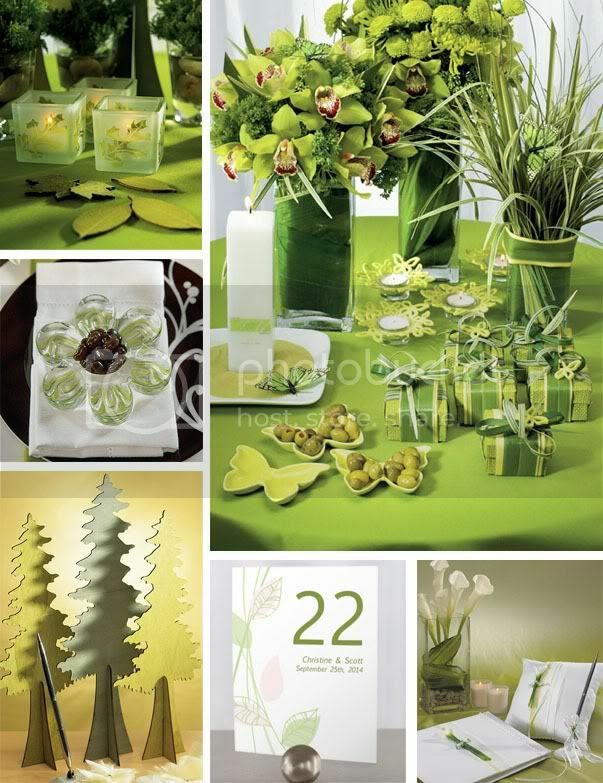 Glam it Up with Green — Weddingstar products: Deep Sandblasted Glass Leaf Cube Tea Light Holders, Battery Operated “Flickering” Tea Lights, Maple and Willow Shaped Wooden Die-Cut Leaves in Woods Green, Glass Flower Holders with Green Highlights, Organic Green 2 Piece Woven Favor Boxes, Felt Butterflies in Green, Hand Painted Butterflies in Green, Ceramic Butterfly Dishes/Holders in Apple Green, Felt Butterfly Ring Candle Holders in Green, Square Vases, Wooden Die-Cut Evergreen Trees, “I Do…Color” Pen with Base in Tone on Tone Champagne, Green Organic Table number, Classic Round Place Card Holder and Bridal Beauty Calla Lily Collection. For many of us, Pink has been our fav color since we were old enough to pick out our own outfits. It can be classy, chic, pretty, and can really help set the mood for a romantic fairytale wedding theme. 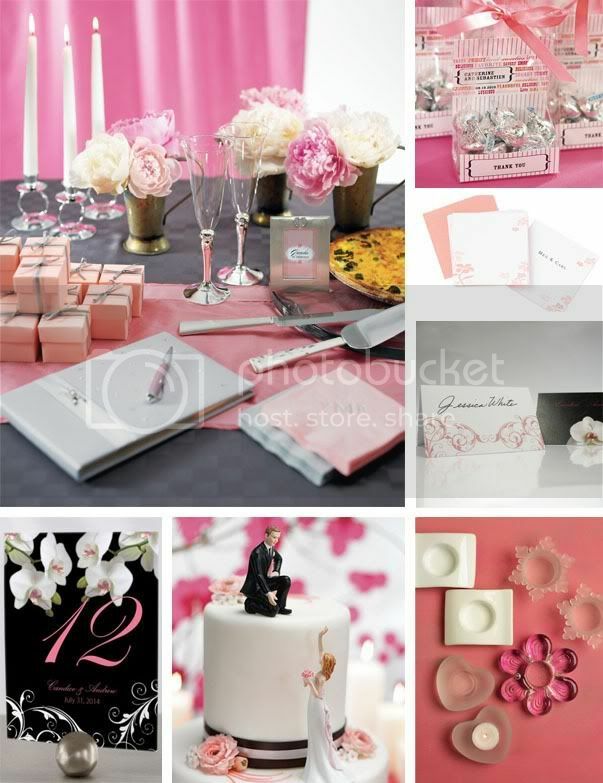 Just be cautious of how much of one shade of pink you have, though — too much and it might look like a Pepto-Bismol bottle threw up all over your venue. Instead, mix it up between pastel pink, soft pink and even hot pink, and they all look great coupled with touches of white. Perfect in Pink — Weddingstar products: Platinum by Design Traditional Guest Book, Printed Napkins in Pastel Pink and Silver Grey, Silver Plated Stem with Cut Out Hearts Goblets, Small Photo Frame with Brushed Silver & Crystals, Venice Silver Serving Set, Double Ring Unity and Taper Candle Holders in Shiny Silver, Taper Candles, Old Time Candy Cellophane Bag Inserts, Floral in Pink Favor/Place Cards, Classic Orchid Place Cards in Pastel Pink, Classic Orchid Table Number in Pastel Pink, Classic Round Place Card Holder, Reaching Bride and Helpful Groom Mix & Match Cake Toppers, Fine White Porcelain Holders, Snowflake Candle Holders in Frosted Glass, Frosted Glass Heart Candle Holders and Glass Flower Holder with Pink Highlights. Brown. At first thought, this probably is another one of those colors you wouldn’t imagine as a fab color scheme for a wedding. But think again! This color has really grown in popularity in the wedding world and many of the classiest accessories look amazing in brown. 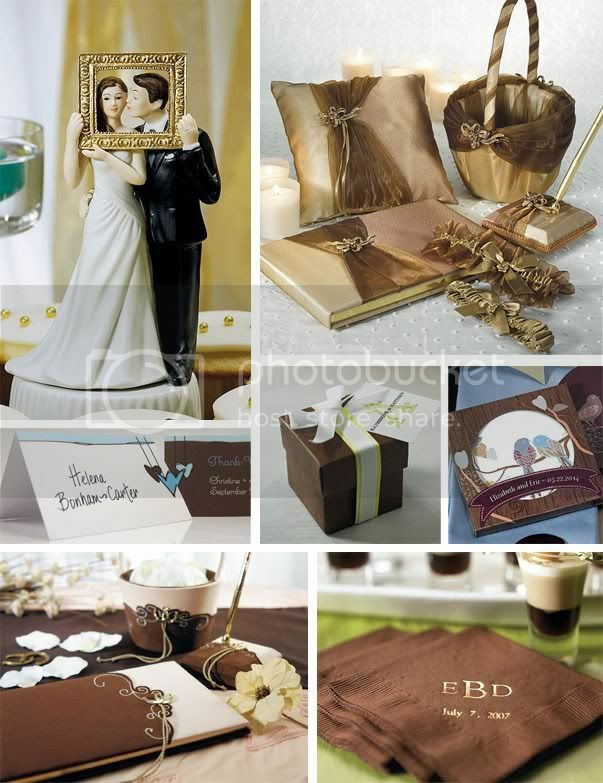 Bold, Beautiful Brown — Weddingstar products: Picture Perfect Couple Figurine/Cake Topper, Bronze Elegance Collection, Votive Candles, Heart Strings Place Cards, Seta Marrone – Chocolate Brown favor Boxes, Plain Ribbon in Candy Apple Green and White, Love Birds Cork Base Coaster Set, Romantic Vintage Western Collection, Plastic Horseshoes in Gold, Silk Rose Petals in Natural White, Printed Napkins in Chocolate Brown and Flared Shot Glasses. Just remember that no matter what color scheme you choose for your wedding day, the right accessories will make it picture perfect. Look for creative ways to incorporate your colors and never be afraid to mix and match.